Books and Monographs published by the MCZ may be found in the Biodiversity Heritage Library. Hall, E. 1964. About the Exhibits. 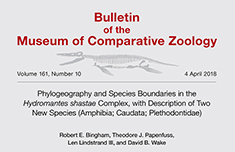 Museum of Comparative Zoology p.56 pp.